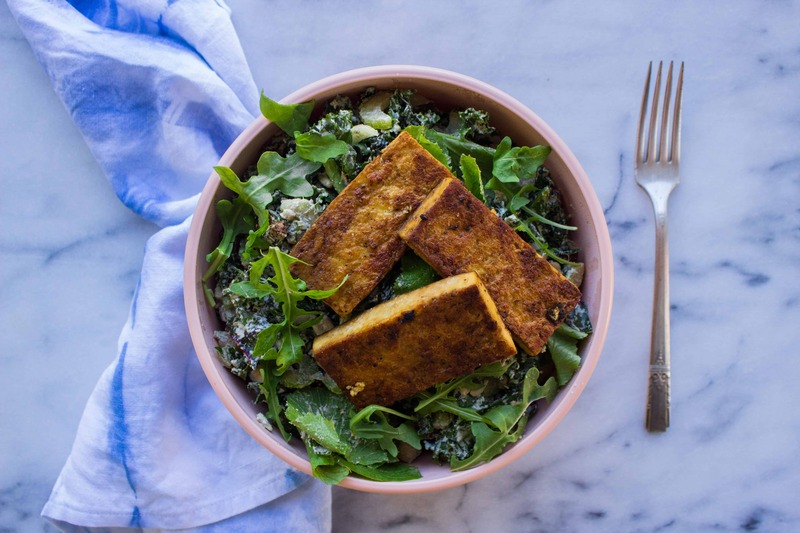 A lot of people find tofu really tricky to prepare and cook, and with good reason. I think everyone has a story about trying to make crispy tofu in a stir-fry and somehow ending up with a soggy, tasteless mess that gets stuck to the bottom of the pan. It’s one of those classic I’m-going-vegan stumbling blocks, but never fear, you’re not going mad: there’s definitely an art to it and I am here to help! Below, you’ll see some FAQs – these are the questions I get asked the most and have tried to answer as honestly as possible. If you have any further questions please feel free to leave me a comment below. Below this, you’ll find my favourite three ways of cooking tofu: quick sautéed, scrambled and marinated. They go roughly in order of time required and difficulty, so if you’re short on minutes or experience start with the first method, and progress to the others. Happy cooking! My tofu always ends up dry. How can I get it crispy but not dry? – Use oil, and try cooking it on a high heat for a short amount of time, rather than on a low heat for a long time. Low heat + lots of cooking time = DRY!! I have no idea how to use soft tofu! Any suggestions? – You can use it in desserts like vegan cheesecakes, but my favourite way of cooking it is to scramble it, much like egg (see recipe below!). 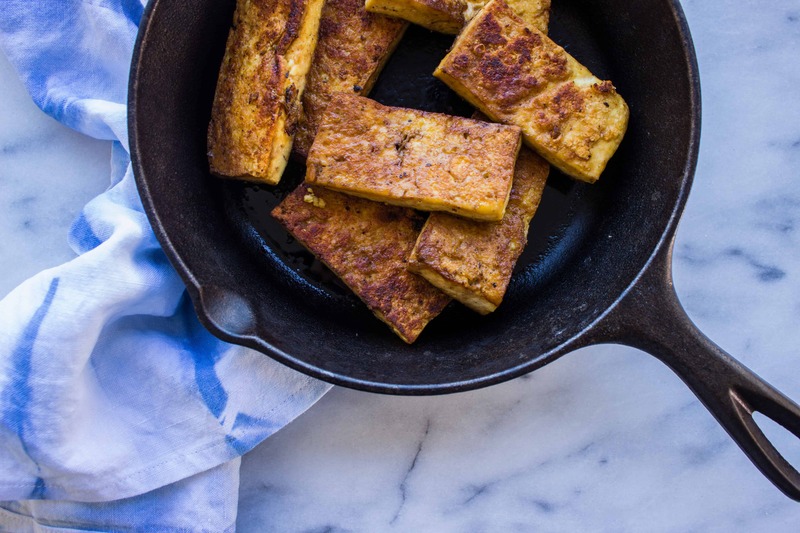 For sautéing and broiling, stick with firm or medium tofu, they will hold up much better than the soft stuff! I’ve heard people talk about draining tofu – do I need to do that?! 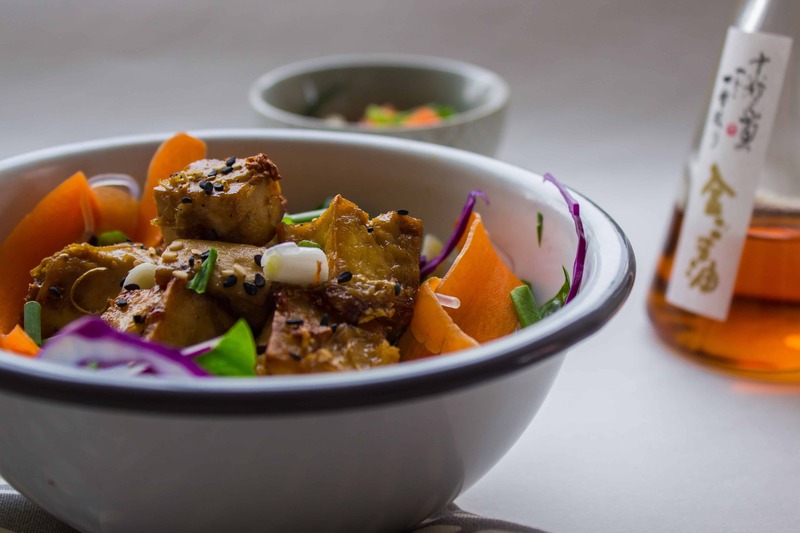 – Draining tofu involves pressing it to remove the excess water, and means it soaks up more flavour, especially when being marinated. Whilst a great technique, I wouldn’t say it’s essential, I rarely get around to doing it myself and I won’t be covering it in this post. If you’d like to know how to press tofu, here is a great article. Can I eat tofu raw? – By all means! If you’re going to eat it raw in a savoury dish however, I’d recommend buying some that’s already been smoked or marinated, otherwise you might find it a bit flavourless. How should I store uncooked tofu if I can’t use it all at once? – Place whatever you can’t use in tupperware, and cover it with fresh water. Store it in the fridge and use within a few days. Can I freeze uncooked tofu? – Yes, just remember to remove any water you’ve been storing it in before freezing. A word of warning though, some types (such as firm) tend to change texture a bit when they’re defrosted again, becoming a bit crumbly. Whilst it’s safe to freeze tofu, I personally wouldn’t recommend it for reasons of taste and texture. On anything! 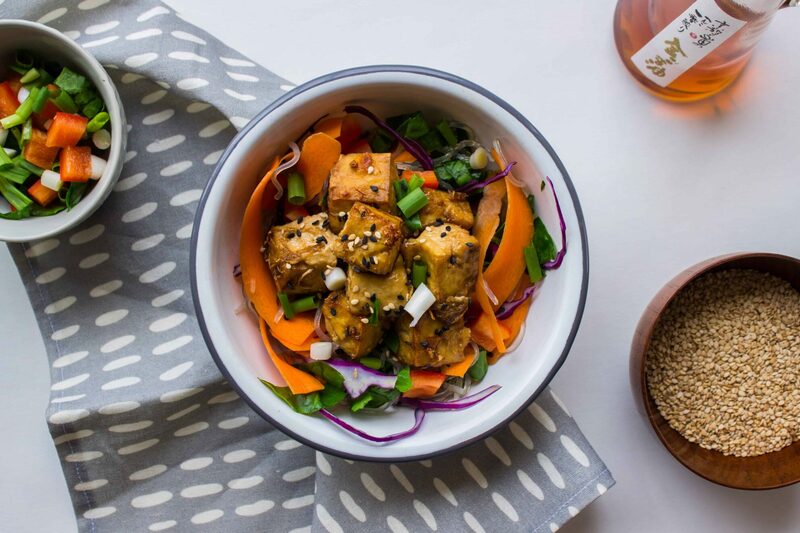 This kind of tofu can be used as a topping for salads, chilis, curries and grain bowls. If you want to keep it simple, use it to top brown rice and steamed veggies. Drain the tofu block from the water it’s in and cut it into about 4 slices, roughly 1cm thick each, then cut these in half, giving you 8 pieces total. Spread the slices on a non-stick skillet or frying pan and coat in coconut oil and 1 tbsp of Braggs Seasoning or tamari. Sprinkle with black pepper. On a medium-high stovetop heat, sauté the tofu for about 10 minutes. Flip each slice over (they should be browned on the bottom) and re-coat with the remaining ½ tbsp of Braggs and black pepper. Sprinkle the crushed garlic between the tofu pieces and sauté for another 5-7 minutes, until the bottoms of the slices are browned. Remove the tofu from its packaging and place it in a large skillet. Add in all other ingredients. Cook the mixture gently on a medium-low stovetop heat for about 20 minutes – stirring regularly – until the garlic, herbs and spices have become fragrant and the liquid from the tomatoes has evaporated. The soft tofu will naturally break up and start to look like scrambled eggs – this is how it should look! Season to taste with salt/pepper and serve. On toast with avocado and mushrooms. 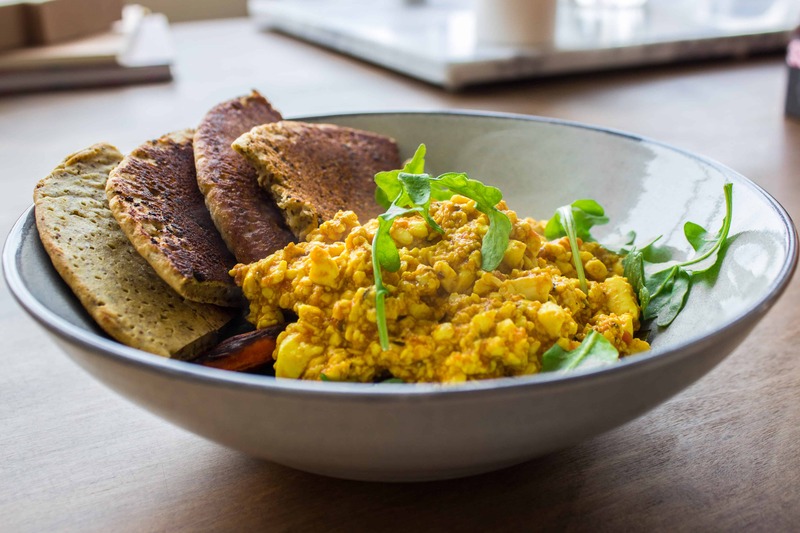 Scrambled tofu is a great breakfast dish! This type of tofu is best served with stir-fries, noodles, pad thai and vegetable pho dishes. Drain the tofu from the water it’s in and cut it into 2cm cubes. Place in a shallow oven-proof dish. In a separate bowl or jug, mix all remaining ingredients (except the spring onions and sesame seeds) to a thick liquid/marinade. Pour this mixture over the cubes, and leave aside to marinate for 30 minutes, flipping the them over every 10 minutes to ensure they are fully coated. Place the oven-proof dish of tofu under your oven’s broiler/grill (top heat only) and cook for 8-10 minutes, until the tofu is browned on top. Remove from the oven, flip the tofu (be careful, medium tofu can be a bit delicate until cooked!) and cook for a further 8-10 minutes. Repeat this process once more, when you should find that most of the marinating liquid has evaporated and the tofu is crispy on the outside and still soft in the middle. Serve immediately!